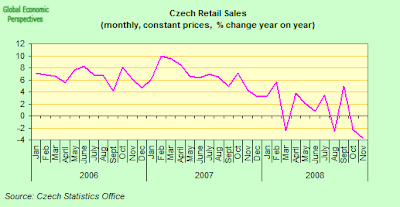 How Near Is The Czech Economy To Recession? The highly open Czech economy is set to slow down considerably, affected by the deteriorating outlook for its main trading partners. Although GDP growth was still solid in Q3 2008, both exports and imports growth slowed significantly. The global crisis is expected to adversely impact the real economy particularly from the fourth quarter of 2008. Overall, GDP is expected to have grown by 4.2% in 2008 with a strong contribution from the external balance. 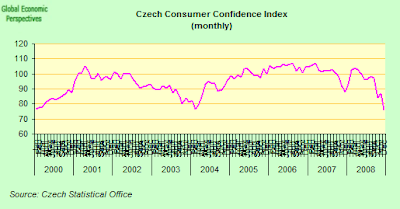 Analysts and followers of the Czech economy are basically agreed on two things at the moment: that the Czech is slowing (and rapidly), and that the dependence on car exports is a real achilles heal at a time when a generalised credit crunch means that the financing which is needed for people to make car purchases often quite simply isn't there. Beyond this point opinions differ. Some expect the slowdown to end in nothing more than a year of sub par growth, with a bounce-back recovery in H2 2009 (this is the view, for example, of Pasquale Diana at Morgan Stanley). Others take a more pessimistic view - like Danskebank's Lars Christensen - and fear that not only may we see a substantial slowdown (bordering possibly on outright contraction) throughout the whole of 2009. but also that strong deflationary forces are at work, forces which may well lead the Czech National Bank to become one of the first European central banks (hand in hand possibly with the BoE) to get into the tricky area of trying to operate monetary policy near the zero bound. 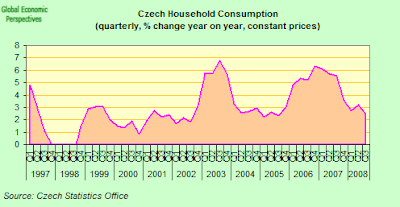 Personally, after a long hard stare at the detailed macro data, I am in the latter camp, and to answer the question I pose in the title of this post, I think the Czech economy is very near to its first quarter of contraction, indeed we may even have seen contraction in Q4 2008. If we didn't it will be a very close call, since the not only has the trade impact been negative, and industrial output dropped like a stone, but domestic consumer demand - as reflected in retail sales - also seems to have been falling. And the outlook for domestic demand certainly does not look any too positive, if the most recent consumer confidence readings are anything to go by, since these have been falling strongly since the summer, and surely suggest strong weakness in household consumption right across the first half of 2009, at the very least. Czech industrial production fell in November at the fastest rate since at least 2000, dropping by 17.4 percent year on year, following a decline of 7.6 percent in October. This fall is very substantial and it is clear that the Czech authorities urgently need to revise their growth forecasts in the light of this and other recent data, indeed some analysts - Radomir Jac at Generali PPF Asset Management in Prague , for example - are already arguing the drop may well mean the economy already started to contract in the fourth quarter. Others are more cautious. Still, one thing is common across all the analyses, we are talking about cars, cars, and ever less cars. The collapse in activity across the region in 4Q08 looks truly extraordinary, and was correctly flagged by the PMI surveys, which sank to all-time lows. Trade data and industrial output and, to a lesser extent, retail sales all show a significant loss of momentum towards year-end. Much of this is due to weaker external demand, in particular in the auto sector, which is the region’s most important export. Car sales in the EU have weakened further, and several carmakers have announced a cut in their production plans for 2009. In the Czech Republic, Hyundai said that it plans to move to a four-day workweek and pay workers 70% of their salaries for a period of 1-3 months; Skoda also downgraded its production plans massively for 2009 (from 700k cars to 570k). The Czech Republic has arguably the most stable economy in central Europe, but at a time when the world is being buffeted by financial crisis, there is no chance it will escape being hit next year. First in the line of fire will be the automotive sector which, with almost 1m cars manufactured this year, is responsible for about 10 per cent of the economy. Almost all are exported to western Europe, where new car sales have plunged in the final months of the year. 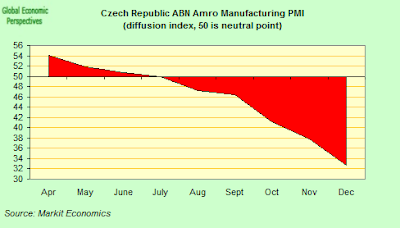 And the situation is almost sure to get worse, since the Czech Purchasing Managers' Index fell to 32.7 in December, from 37.8 in November, which indicates a very substantial fall in industrial output again in December. Thus we can expect Q4 industrial output to be a strongly negative factor, and indeed this only marks a steepening of a trend we have been seeing since Q1 2008, if we look at the quarterly chart for movements in manufacturing output below. The fall in industrial output is basically a reflection of the ongoing deterioration in the CR's performance in external trade, and the drop indemand for exports. The monthly goods trade deficit was CZK 474 million in November, down from the very large CZK3.95 billion deficit registerd in October, but well below the CZK 12 billion surplus clocked up in November 2007. Exports were down 18% year-on-year in the month compared with a 10.7% fall in October. 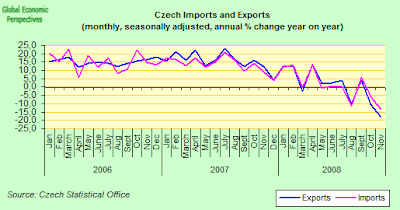 The statistics office report said the decline in exports was the highest in the entire history of the Czech Republic. Imports declined 13.2% compared with a 5.9% drop in October. Total imports slipped to CZK 195.2 billion from CZK 221.4 billion. In November, seasonally adjusted retail sales in retail trade (excluding cars) decreased by 0.3% month-on-month (at constant prices) and fell by 0.7%, year-on-year. As far as the automotive sector goes, seasonally adjusted sales were 3.4% down, m-o-m, and 5.1%. Sales were also down 0.7% month on month in October. With all this negative data it is hardly surprising that the Czech koruna has been weaking significantly of late, and it depreciated again last week, losing as much as 1 percent on Friday alone (hitting 28.255 against the euro at one point, the weakest since July 2007) and 2.1 percent on the week. 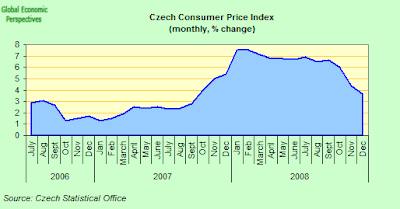 Consumer prices in the Czech Republic were down again in December, and fell by 0.3% when compared with November. Year-on-year consumer prices were up by 3.6 % in December (down from 4.4 % in November), while the whole year average was 6.3 % in 2008. As is to be expected the month-on-month drop in consumer prices was lead by the fall in automotive fuel - 95 octane petrol hit its lowest level since March 2002, while food and non-alcoholic beverages were mainly down, with pronounced falls in the prices of flour, milk, butter, citrus fruit and sugar (by 6.7 %, 1.7 %, 2.7 %, 8.6 % and 1.9 %, respectively). But prices drop were far more general, and in the health sector, for example, medical products dropped by 0.5 %. Prices of goods in general decreased by 0.5 %, while prices of services increased by 0.1 %. 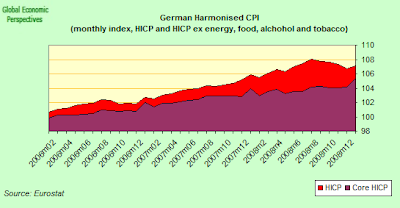 But what is perhaps more interesting is the way in which the "core" EU HICP index (ie excluding food, alchohol, tobacco and energy) has now been falling since August, and I do not expect to see an increase in this index in 2009, which means we should see negative core inflation in the CR in 2009. Industrial producer prices are also falling, and were down by an annual 1.5% in November. The most significant price decreases were observed in ‘coke, refined petroleum products’ (-19.0%), ‘basic metals, fabricated metal products’ (-2.1%) and ‘chemicals, chemical products and man-made fibres’ (-3.8%). Prices of ‘food products, beverages and tobacco’ fell by 0.5%. The big issue now is what will happen to inflation expectations? The strongest defence against the arrival of deflation is the expectation of inflation to come. To date these expectations have held up, but they could well turn negative at some point, and if this were to occur it would have a very significant impact on consumer behaviour (since evidently it is more interesting to delay that whimsical purchase till tomorrow, when the thing will be cheaper). If expectations do turn significantly negative, then it could turn out to be very hard work indeed getting them back into positive territory. Which is why I suspect the CNB will be pretty proactive, possibly more proactive than many are anticipating. Moving Towards The Zero Bound At The CNB? The Czech National Bank, whose next policy-setting meeting is scheduled for 5 February, have been cutting their benchmark borrowing rate pretty aggresively since last October, taking it down to 2.25 percent at its last meeting in December. The drop of industrial output is “really considerable,” central bank board member Robert Holman said on Patria.cz. The bank’s “pessimistic” forecast scenario is starting to be fulfilled, he said. The latest central bank forecast cut the outlook for 2009 economic growth to 2.9 percent, although the bank had an alternative (pessimistic) scenario which foresaw growth of 0.5 percent this year. 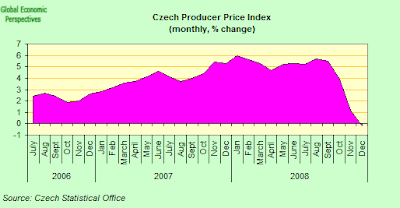 Today’s industrial production numbers and the outlook for inflation to drop to just above 1% in January should make the Czech central bank (CNB) even more dovish. We now expect a cut of at least 75bp at the next CNB board meeting in February. Furthermore, we would not rule out that CNB could be the first European central bank (maybe with the Bank of England) to go to (near) zero per cent interest rates. 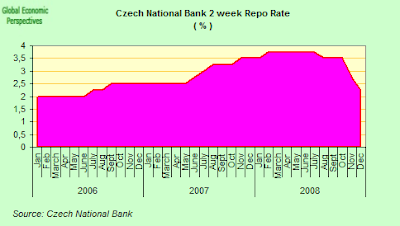 Therefore, we also recommend buying EUR/CZK at current levels. So far, January’s economic data published support our view that the CNB’s Bank Board Members are ready to continue easing, following the 150bp cut in policy rates in 2H08 to 2.25%. However, yesterday’s data have led us to review our previous forecast of a 50bp cut in the CNB’s policy rates, and we now believe a 75-100bp cut is likely to be discussed at the February meeting. Furthermore, we do not exclude the possibility that the CNB’s main policy rate could breach its all-time low (which was 1.75% in 2Q-3Q05) in February. I am with Lars Christensen and Jaromir Sindel here, I think the CNB will move, and move pretty decisively to try to block the path to looming price deflation, and I guess a 75 bp cut (and possibly more) is looking very probable, with further cuts following inswift succession. Evidently the key piece of data will be the January manufacturing PMI, and in the short term I expect the PMI and not the actual output data (which obviously come later) to be dictating policy decisions. The statist office releases simply serve to calibrate the PMIs (post hoc) in this type of situation. 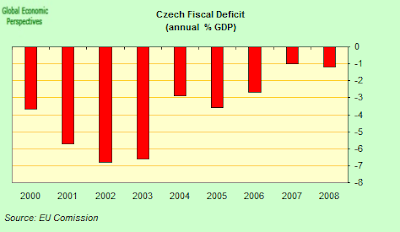 So What Is The Outlook For Czech GDP Growth in 2009? Well, in trying to determine the future path of Czech GDP, the first thing we need to bear in mind - looking at the GDP chart above - is that the economy has been losing momentum since late 2006, that is the "stellar" catch-up growth component has been waning, and for some time. The second thing we need to bear in mind is that this is not necessarily a bad thing, since it means that the CR's economy (unlike many others across the CEE) is certainly not on a boom bust cycle. The slowdown in quarter on quarter growth is also evident in the chart below. 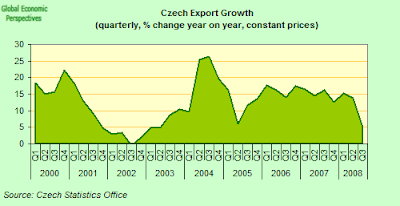 In fact in Q3 2008, Czech GDP grew by 1.0% in comparison to Q2 2008 and by 4.7% in comparison to Q3 2007. What is interesting is that the weaker growth we can see in the chart has been largely a by-product of slowing private consumption growth (see my earlier post here, and this one here), which leaves us with the possibility that the Czech Republic economy - following along the path already charted by Germany, Japan, Italy and Hungary - may now be in the process of becoming an export dependent one. (Perhaps it sounds strange to talk about Italy as export dependent given its very weak growth, but this weak growth is in fact the outcome of continuing very poor export performance, since domestic demand has now been weak for more years than I personally care to remember). 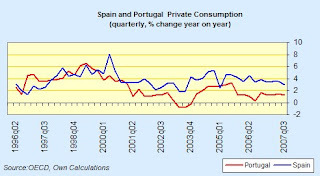 In fact final domestic consumption was still up by 2.7% in Q3 2008, and represented a contribution of 1.9 p.p. to GDP growth. Final consumption was particularly influenced by a year on year increase in household expenditure by 2.5% , while government expenditure grew by 3.7%. Fiscal stimulus should hold the government component steady, but I would expect the household one to drop back, and especially as we start to see job losses from the industrial contraction. Gross capital formation was down by 2.0% on Q3 2007 and had a negative impact of 0.5 p.p. on GDP growth, although gross fixed capital formation taken alone was up by 4.5% y-o-y; in fact investment in transport equipment and in machinery and equipment was the main source of GFCF growth. As in earlier quarters, external trade in goods and services was the main source of economic growth in Q3 and contributed by 2.8 p.p. to the GDP increase, despite a considerable fall in y-o-y growth rate of exports (from 13.9% in Q2 to 5.0% in Q3). This was the result of the marked fall in import growth (from 9.7% to 1.6%), hence external trade remained the principal source of GDP growth. Reflecting Citi’s expectations of a recession in the eurozone, we forecast the trade surplus (both of goods and services) to shrink significantly in 2009 from its surplus of CZK108 billion in 2008 (our estimate).Falling commodity prices are likely to have been behind the improvement in the terms of trade in November, which fell in October. We believe this development has the following implications: the improvement in the terms of trade is likely to cause the foreign trade’s first negative contribution to GDP growth after three and half years, and GDP growth is likely to fall quickly to the levels of real gross domestic income, which was 2% YoY in 3Q08 and much lower than that of GDP growth of 4.3%. Employment growth, which has been one of the hallmark features of the Czech expansion, continued to grow in the third quarter and was up by 0.4% q-o-q and 1.9% y-o-y. Labour productivity measured by gross value added per employed person was also up (by 2.3% y-o-y). There were 5.327 million Czechs in employment in Q3 2008, 98,000 more than in Q3 2007. However, there is now some evidence that this favourable situation may now be changing. Certainly, if we look at the chart below, the substantial drop in unemployment in the CR since 2005 is very impressive, and indeed even though the seasonally adjusted EU harmonised rate ticked up from 4.4% in October to 4.5% in November (the last month for which Eurostat have released data) the change is hardly a dramatic one. However, if we look at the data from the CR's owb labour office, we find a reasonably sharp increase from November to December (unemployment was up by 32,000, compared with a 7,000 rise in December 2007), and if we look at the situation vis a vis vacancies (see chart below), then it is clear that the deterioration in manufacturing conditions is now affecting the labour market, since the number of vacancies advertised has now fallen from the April 2008 peak of 152,300 to December's low of 91,200 (the lowest number in over 2 years, which is all I have data for). The CR does run a current account deficit, but it is actually a fairly moderate one in a regional context, although it is liable to increase in 2009. November’s narrower current account deficit reflects the slightly improved trade balance over October and lower dividend outflows from FDI, which dropped to CZK3.5 billion from October’s CZK12.3 billion. The current account financing requirement has been low but the deficit may have reached 2.8% of GDP in 2008 (up from 1.8% in 2007, and above the IMF estimate of 2.2% GDP). The EU Commission forecast thatgeneral government deficit will be 1.2% of GDP in 2008. This reflects a much-lower than- expected deficit of 1% of GDP in 2007 and the positive fiscal impact of a variety of revenue and expenditure measures. For 2009, they expect the general government deficit to widen somewhat given the pressure on revenues and expenditure which will result from falling activity, rising unemployment and probable fiscal stimulus measures. Overall, they suggest that the general government deficit will widen to 2.5% of GDP in 2009 but should fall back to 2.3% in 2010 - although this surely reflects their benign slowdown scenario whereby a recivery is expected to arrive in H2 2009. The debt-to-GDP ratio is forecast to rise to above 30% in 2010, from 29.4% in 2008. This is basically the third in a series of posts, where I have looked at the short term outlook for three key central European economies: Poland (here), Hungary (here) and the CR, and the conclusion is that they are all headed into or near to the contraction zone in 2009. Cetainly Hungary is the worst case scenario, and Poland is struggling with a complex set of forex issues, but even the Czech Republic can not expect to escape unscathed. 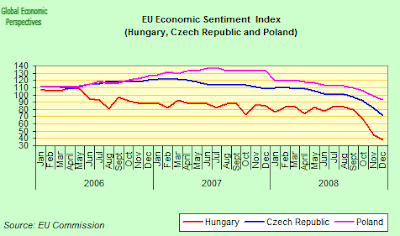 Previously, as can be see in this chart for the EU Economic Sentiment index, Poland had been faring rather better its Central European neighbours. But the downward movement in Poland is now evident and pronounced, and in fact the contraction may ultimately be sharper than in the CR. 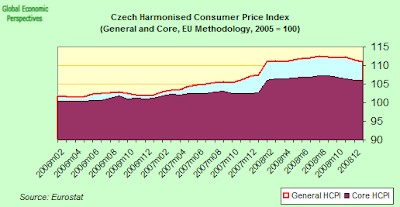 In their January forecast the EU Commission estimated that GDP growth in the Czech Republic would come in at 1.7% in 2009 and then edge up again to 2.3% in 2010. This now seems very much on the high side to me. 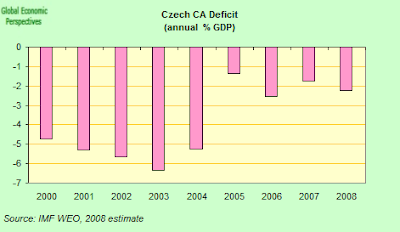 I expect Czech GDP to be more or less stationary in 2009, with some downside risk to this estimate given the general problem of economic stability in the region and the very serious contraction which is like to take place in the German economy on which the CR is so dependent. I do not expect a resurgence in domestic demand, and the economy will now more than likely become even more export dependent, which leaves us with the omnipresent question, "exports to where"? On the other hand, at the present time we do are not looking at a "boom-bust" scenario, and the CR economy should fare substantially better than many of those around it. Well it's pretty clear to me at least that there is now one, and only one, major and outsanding topic towering head and shoulders above all those other pressing and important problems those of us following the EU economies currently find lying in our macro-policy in-trays: the issue of wage cuts. Not since the 1930s has the possibility of such a generalised reduction in wages and living standards loomed out there before policymakers, and doubly so if we now hit - as I fear we may well for reasons to be explained at the end of this post - systematic price deflation in a number of core European economies. The issue that has suddenly and even violently erupted onto the European macro horizon over the last week (as if we didn't already have sufficient problems to be getting on with) is, quite simply, how, if they either don't want to, or can't, devalue, do politicians successfully go about the business of persuading the people who, at the end of the day, vote them into office (or don't) to swallow a series of large and significant wage cuts? And this is no idle and abstract theoretical problem, since in the space of the last week alone the issue has raised its ugly head in at least four EU member states - Ireland, Greece, Latvia and Hungary. In the case of the first two of these devaluation simply isn't an option, since there is no a local currency to devalue, while in the case of the latter two the presence of prior large scale foreign currency borrowing means that authorities are nervous about anything that smacks of devaluation (since the providing banks would take large losses following the inevitable defaults, and the cooperation of these providing banks is necessary in the future if the economies in question are ever to recover). This latter view (no devaluation) prevails even though many economists, (including myself), would argue that is a highly questionable one, since wage deflation on a sufficient scale will ultimately produce those very same defaults (with the added schadenfreude, as Paul Krugman points out, that even those who have borrowed in the domestic currency are also pushed into default). Now, there is already quite a debate going the rounds on the merits or otherwise of devaluation in the Latvian case (see IMF Central European representative Christoph Rosenberg here or RGE Monitor analyst Mary Stokes here), but what I want to focus on in this post is the acute difficulty faced by any elected politician when it comes to enforcing wage cuts. This has to be one of the most important arguments in favour of devaluation, at least from the practical policy point of view. And this is also why, in my humble opinion, the IMF constantly ends up being the whipping boy, since the easiest way for any local politician to try to side step the responsibility for taking difficult decisions is to throw the country to the mercy of the "dreaded" fund (or at least, as seems to have happened in last weeks Irish case, threaten to do so), and then tell everyone that there simply is no alternative, as "they" will accept nothing less. All this puts me in mind of the popular urban legend according to which mothers in Naples put the fear of god into their recalcitrant offspring by warning them that they'd better darn well behave since otherwise "the Catalans will come" (in reference to an infamous incident in the aftermath of the War of the Sicilian Vespers in which Catalan Commander Roger de Flor allegedly massacred 3000 Italian soldiers on his arrival in Constantinople - for default on a debt as it happens - simply because his mercenary troops had not been paid). Now mothers all over Europe are apparently telling their children "lock the front daw, Dominique Strauss Kahn is Coming". The Irish Gaffe, Or Just Another Load Of Old Blarney? First Up this week was Irish Prime Minister Brian Cowen, whose alleged threat to call in the IMF if the trade unions did not agree there an then to all overall 5% wage cut for public sector workers (a threat which was subsequently denied) made quite a few waves in the press and even got as far as producing an official denial on the part of the Fund. Prime Minister Brian Cowen, while at an investment conference in Tokyo on Wednesday, was reported to have endorsed the view of an Irish union leader that the parlous state of Ireland's public finances could lead to the IMF ordering mass dismissals of public sector workers. Dan Murphy, the general secretary of the Public Service Executive Union, had previously told his branch members that the Fund could intervene if public spending was not curtailed, according to the Irish Times......As for public sector wages, the prime minister's comments may simply have been an attempt to scare unions into agreeing to public sector wage cuts. That ploy "may have backfired somewhat," for all the attention it has now received, remarked Rossa White, chief economist at Davy stockbrokers. Around 20.0% of Ireland's 1.2 million-strong workforce get their salaries from the state. While that proportion is not unusual in Europe, wages are unusually high, as are their accompanying pension benefits. The Irish government is now working to scrap a 6.0% pay increase it announced last September--badly timed to have launched around the time of Lehman Brothers Holdings' collapse--and White believes another 10.0% cut is needed. Cowen was swiftly followed out of the starters box by IMF Managing Director Dominique Strauss-Kahn who must certainly have been the highest profile vistor to pass through the VIP lounge at Budapest Ferihegy's airport last week as he found himself having to take time out to fly-in and offer a spine-stiffener to a government who were giving every indication of backtracking on the 8% public sector wage cut they had agreed to as one of the conditions for the 20 billion euro IMF-lead rescue loan. Strauss-Kahn arrived amidst a notable weakening in the value of the forint, and all manner of speculation about whether or not the fund was set to withhold the second tranche of the loan. At the heart of last week's visit were concerns about the size of Hungary's 2009 budget deficit, since while Hungary has been steadily reducing the size of the deficit as part of the austerity programme agreed to in the summer of 2006 and the deficit was down to around 3.3% of GDP last year, according to Finance Minister János Veres last Tuesday, it is not clear what impact the recession will have on the 2009 target number of 2.6%. And we still need to say "about" 3.3% for the 2008 deficit since we evidently don't have a final figure for Hungary's 2008 GDP on which to make a more precise calculation. The days before Strauss-Kahn's visit were rife with speculation that Hungary might be forced to adopt new austerity measures in order to stay on track with its deficit target, with analysts estimating Hungary could be set to overshoot the target by something in the region of HUF 200 billion-HUF 250 billion, due to the recession being deeper than expected and a sudden drop in inflation. Lower than anticipated GDP growth is important since Hungary currently has an estimated 0.9% contraction pencilled-in for its fiscal calculations, while in reality the final outcome may be anywhere between minus three and minus five percent, depending on the view you take (in fact the EU Commission Hungary 2009 Forecast - out today has -1.9, but this is almost certainly too optimistic). Also the sudden drop in inflation is also taking everyone by surprise, since if prices are lower than expected then VAT returns etc will be down accordingly, too. Hungary's inflation stats will likely undershoot the current forecast, Veres emphasized, confirming analyst expectations for a significantly lower inflation path for Hungary (the current market consensus for annual inflation in December 2009 is 2.6%, but again personally I think this is way too high). "Currency traders in London took a sentence out of context in last night's media reports (which included Portfolio.hu coverage) which said the International Monetary Fund might cancel October's credit agreement with Hungary. This was the main reason for extreme pressure on the forint this morning," a Budapest-based trader told Portfolio.hu. After this morning's statement by Finance Minister János Veres, who claimed it was “impossible" for Hungary not to meet fiscal targets (or else the government was ready to take further austerity measures), market players began to see that the panic was unsubstantiated. As a result, we have seen an intense correction towards midday, the trader argued. So Hungary's 2009 budget is in trouble, and this is partly due to exaggerated inflation and growth forecasts, and partly due to some hefty government compensation for state employees who lost their “13th month" bonus at the end of 2008. Arguably it was this latter point which was the main reason for the IMF Managing Director's visit. Strauss-Kahn met with Prime Minister Ferenc Gyurcsány, Finance Minister János Veres and National Bank of Hungary Governor András Simor, President of opposition party Fidesz Viktor Orbán, and a number of MPs, according to the IMF press release. Apart from putting a stop to any kind of "back door" compensation for wage cuts, the tangible outcome of the meeting was a battery of agreed measures intended to bring the budget deficit back into line with targets. “In order to partially offset the loss of budget revenues, we do not want to rule out the possibility of tax hikes," Hungary's Finance Minister János Veres told a morning talk show on Hungarian TV channel ATV. Veres did not make direct reference to a VAT hike, but recent press leaks and comments from analysts suggest that this may well be in pipeline. Naturally Strauss-Kahn explained at his post meeting press conference that the International Monetary Fund was generally satisfied with Hungary's efforts to meet the conditions for the IMF loan (he was, of course, hardly likely to say otherwise in public), and he even dangled out the possibility that the loan might be extended beyond 2010 if economic condititions made it necessary. We will return in the future to this point, since as I personally cannot see the present plan working as anticipated, I cannot help asking myself when it will be (if ever) that Hungary is able to be discharged and certfied as fit to stand on its own by the fund. Or are we about to see the creation of a new set of Fund Economic Protectorates, a possibility which I'm sure was never envisaged by the institution's founders. But things were obviously a lot hotter under the collar (despite the snow) in Riga round about the same time, since according to the Financial Times Latvia’s president threatened to call early elections last Wednesday after anti-government protests led to the Baltic country’s worst rioting since independence in 1991. Such demonstrations - and similar ones in Bulgaria and Lituania (shown in photo) - raise doubts over whether Latvia’s government actually has enough political and social capital to implement the painful austerity plan agreed with the International Monetary Fund last month as an alternative to devaluation. About 10,000 Latvians demonstrated in Riga’s Dome Square on Tuesday night in a rally called by opposition parties, trade unions and civic organisations. The demonstrators accused the government of corruption and of economic mismanagement and demanded that elections – not due until 2010 – be brought forward. The government now forecasts that the economy will contract 5 per cent this year and unemployment will soar to 10 per cent. The Latvian government is well aware that strong adjustment will be needed to ensure success. In fact, most of the tough measures—including a nominal wage cut in the public sector of no less than 25 percent—was proposed by the Latvian government itself. This shows that the economy—including the labor market and the wage-setting mechanism—is very flexible, much more flexible than in most other countries, even outside Europe. The IMF is supporting the government's policy package through a $2.4 billion loan, with the EU, the World Bank, and a number of bilateral creditors providing additional financing. Marek Belka, Current Head of IMF's European Department, quoted in IMF Helping Counter Crisis Fallout in Emerging Europe, IMF Survey Magazine. What really seems to have angered people are the conditions attached to the €7.5bn stabilisation package agreed last month with the International Monetary Fund and the EU after the nationalisation of the country’s second largest bank shook confidence in the country’s fixed exchange rate. In particular Latvian citizens seem to have been upset by the stringency of the austerity package since in the letter of intent Latvia undertakes to limit budget spending to under 40% of GDP, and this in the context of a sharp contraction in GDP is not an easy thing to do- Clearly not of the envisaged measures are popular - cutting wages in the government sector by about 15%, freezing pensions as well as cutting back government spending on goods and services. And in addition to the cut in provision an increase in VAT is also being contemplated. All this contrasts, however, with the measures envisaged for restructuring the banking sector, including recapitalization of banks, honoring liabilities via the deposit guarantee fund and ensuring the maintenance of confidence in the various liquidity instruments, all of these areas of spending where increases in spending will be permitted. Of course, once you decide to stay on the peg there is no avoiding this, but it is hard for ordinary people to understand that this is not simply favouring Nordic banks at the expensive of Latvia's pensioners and unemployed. Greece, as ever, is steering a rather different course. In the Greek case it is not the IMF who is waving the big stick, but the credit rating agencies, in the shape of Standard & Poor's who last week cut its credit ratings on Greece's sovereign debt, already the lowest in the 16-nation euro zone, to A- with a stable outlook from A. Greece was only one of four euro zone countries who have been warned by S&P recently that they may have their ratings cut, and ideed Spain has only today had its rating cut too. "The ongoing global financial and economic crisis has in our opinion exacerbated an underlying loss of competitiveness in the Greek economy," S&P credit analyst Marko Mrsnik said. "In our opinion, the ongoing slowdown in credit growth will likely lead to a deceleration in domestic demand, thus increasing the risk of a recession and a possibly protracted adjustment." S&P said Greece was entering the downturn with a fiscal deficit of around 3.5 percent of GDP, after repeated government failures to bring expenditure under control and reduce high debt levels despite years of economic growth averaging four percent. Following the announcement, spreads in Greek 10-year government bonds over benchmark German Bunds widened by about 10 basis points to a session high of 246.9 basis points. 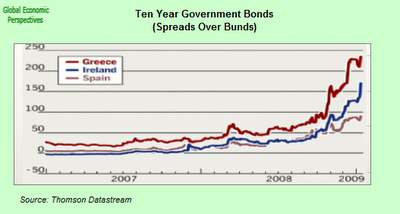 The extra interest Greece must pay to borrow money for 10 years as compared with Germany stands at 246 basis points, while for Ireland the figure hit 180 basis points, also a record, and spreads have widened too for Spain and Portugal. Wage moderation and enhancing wage flexibility are important challenges. The authorities will continue with the policy of containing increases in basic wages of government employees and are hoping for a favorable signaling effect on private sector wage settlements. However, in recent years, wage increases in the private sector have been relatively large and often exceeded productivity growth. It should not surprise us then to learn that one of the key areas of controversy behind the recent Greek protests was a law which effectively ended the employees' right to collective wage contracts - a law which won approval in the Greek parliament last August. The government justified the move by saying that it wanted to clean-up debt-ridden state companies and overhaul protective employment laws in an attempt to attract more foreign investment. The now-dismisssed Greek Finance Minister Alogoskoufis recently told parliament the reform should be pushed ahead "for the sake of the Greek economy and society," since higher wages have added to state companies' debts, which ordinary Greeks had to cover with their taxes. A much fuller review of the Greek problem can be found in my "Why We All Need To Keep A Watchful Eye On What Is Happening In Greece" post. IMF Survey Online: The IMF appears to be advocating fiscal restraint in all of its loan programs in Europe. Wouldn't these countries recover faster with fiscal stimulus packages? Marek Belka: The answer is obvious: can a country finance its borrowing requirements or not? If only these countries could afford a larger budget deficit, fiscal stimulus would have been fine. 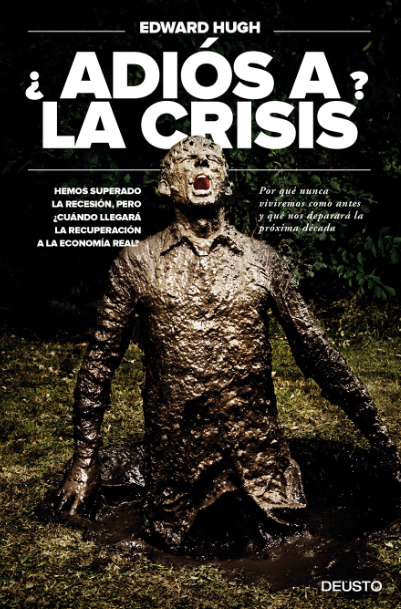 But when a country is already in crisis, the main problem is usually to come up with enough liquidity. In these cases, fiscal restraint is necessary. Choices in a financial crisis are very constrained. Well really there are no very easy solutions here, and anyone who suggests there are is kidding you. In all the countries we are talking about above (and a good few more) the citizens, and the corporates (and in some, but not all, cases the governments) are very highly leveraged (indebted in relation to their realistic future income expectations) and the debt accumulation process has pushed living standards to a level which is higher than sustainable. Just think of your own household. If you push all the available credit to its limit during the first half of a year, its clear you can't live on the same level in the second half unless you keep borrowing, but when the lenders not only won't allow you to do this, but even have the nerve to ask you to pay some of your borrowings back, well then your standard of living in the second half is bound to drop, and this, of course, is what is happening across all these countries. There is an additional problem here, however, since all that "over-the-top" borrowing drove these countries forward above their normal "capacity" level, and that is also what all the above four economies have in common. This driving-forward beyond capacity is what is called "overheating", and this overheating is normally reflected in above average inflation, which is again what we have seen in these countries. The end product is that they have not only an indebtedness problem but also a competitiveness one, and that is what the IMF packages are intended to address. Of course, the problem is if you get your salary cut it becomes harder to pay back the money you owe (loan defaults) and you can't spend as much on consumption (demand slump). And on top of this, as these first two lock-in, government revenue falls (less VAT) while expenditure rises (unemployment payments and bank bailouts), so we get fiscal deficit problems. So not only do you have banks lending less, households spending less, and companies investing less (as demand drops), we also have governments finally forced to cut back (at least in the more vulnerable economies), as the ratings agencies get to work. So you get a downward spiral of falling wages, and falling prices as GDP just comes down and down. And this process can become systematic (deflation) meaning that nominal GDP starts falling even faster than real GDP, making for a car that becomes increasingly "wobbly" and difficult to steer. In this environment, there really is only one way to halt the spiral, and to jump start the economy, and that is to export, and to try and encourage export directed investment. But to get going with exports you need to recover competitiveness. 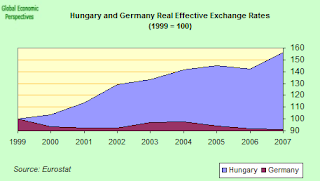 You can achieve some of this restoration via productivity improvements, but not enough, and not quickly enough, especially if the distortion is large, and has been going on over a number of years (see the real exchange rate chart for Hungary above). So you can either do one of two things, devalue, or cut wages and prices. Neither is easy, but as we are now seeing the second is hardly universally popular either. The German economy is about to suffer its deepest recession since World War II according to economics Minister Michael Glos speaking in an interview with the German newspaper Welt am Sonntag due to be published tomorrow (Sunday). Glos said growth in Europe's largest economy is now expected to drop by as much as 2.5 percent this year (and there is still downside risk here). Earlier government estimates had been for slight positive growth (0.2 percent). This suggests that the miracle export-driven-recovery in German economic performance that so many were enthusing about in 2007 has actually been a short lived, one-off, affair, driven largely by an unsustainable lending boom in the UK, and Southern and Eastern Europe. 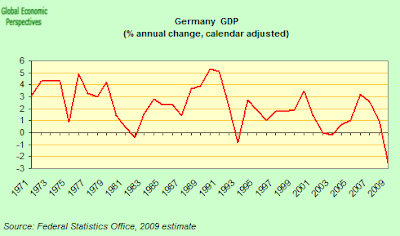 If we take as good this year's government estimate, it gives us average growth for the German economy over the last 10 years of 1.07%, hardly changed from the supposedly "correctional" pace attained between 1995 and 2005 (see chart below) - or is Germany's lost decade now surreptitiously going to convert itself (like its Japanese equivalent) into the lost decade and a half? 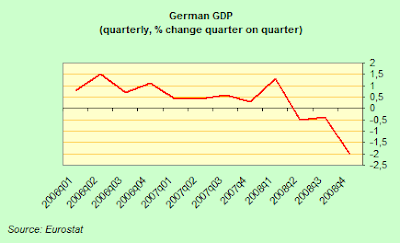 Germany's economy started contracting in the second quarter of 2008, and went officially into recession in third quarter. Further the Federal Statistical Office estimated this week that the economy may have shrunk quarter on quarter by as much as 2 percent in the fourth quarter (ie at an annual contraction rate of 8%), and that annual growth for 2008 may have been as low as 1.3 percent (non calendar adjusted - 1% calendar adjusted) - about half the 2007 level. Was any of this foreseeable? Well I was predicting annual GDP growth in the 1.3/1.4% range for 2008 back in July last year (see this post on RGE Monitor), and I have attempted to raise an alert about the possibility of Germany falling into deflation (this post here), a risk I now think to be real and immediate with a contraction in GDP of between 2% and 5% (which I think is where we are, and it wouldn't surprise me to see the 2009 number coming in at the steeper end of this range. I mean I think there is more bad news coming in Southern and Eastern Europe that has not been factored-in yet). Germany’s inflation rate fell to its lowest in more than two years in December, declining to a 1.1 percent annual rate from 1.4 percent in Novembe. That’s the lowest level since October 2006. Month on month prices actually rose 0.4 percent, and in fact both the general and the core indices spiked upwards at the end of last year (see chart), but given the extent of the contraction which we can expect, I really don't think that this is going to be very typical. Unemployment in Germany rose last month for the first time since February 2006, thus bringing inauspiciously to an end an unprecedented 34 month labour-market recovery. Figures released by the Federal Labour Agency last week show that the number of those seeking employment in Germany rose by a seasonally-adjusted 18,000 in December. The change is small, but the significance is great, since this is obviously but the first month of many when unemployment will rise in Germany, and this rising unemployment will now, in its turn, feed back into the industrial slowdown which is already underway. The seasonally adjusted unemployment rate remained unchanged (following data revisions for previous months) at 7.6 percent. This is hardly a surprise, but it is certainly not good news. 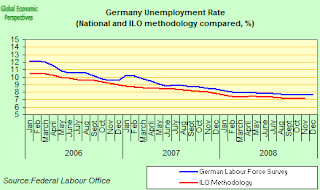 In a separate release the Federal Statistical Office reported that the number of persons in employment living in Germany was 40.83 million in November 2008 - up by 500,000 persons on the same month a year earlier. However, the relative increase (+1.2%) was the lowest rate of growth since December 2006. In January 2008, the relative increase compared with a year earlier was 1.7%. So the economic downturn is finally beginning to show up in the labour market, too. As compared with October 2008, there were 12,000 more people working which compares with an average increase of 53,000 in November 2005, 2006 and 2007. The reasons for the uptick in German unemployment are not hard to find, since German exports fell back at a record rate in November - in fact seasonally and working day adjusted current-price sales exports fell back 10.6 percent from October (when they declined 0.6 percent), according to the latest data from the Federal Statistics Office. This is the biggest monthly drop since records for a reunified Germany began. November exports dropped 12 percent year on year, while imports fell 5.6 percent on the month and 0.9 percent from a year earlier. The trade surplus (which is the key consideration when it comes to GDP growth) narrowed to 9.7 billion euros from 16.4 billion euros in October, and almost half the April rate of 18.8 billion euros. The current account surplus was down to 8.6 billion euros. The immediate future looks even worse, with the latest data from the Technology Ministry showing new orders fell 27.2% (on aggregate) in November (as compared with November 2007) following a 17.5% annual reduction in October, while export orders fell back 30% year on year. 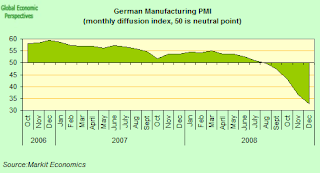 In fact it has been the sharp drop in orderswhich has sent Germany's manufacturing sector into headlong contraction, and the sector shrank at the fastest rate in over 12 years in December, with the Markit Purchasing Managers' Index (PMI) falling to 32.7 - down from 35.7 in November. The reading, which showed the sector contracting for the fifth month running, was the lowest since the series began in April 1996, while the sub-index for new orders also fell to a series record low. So what can the German government do? Well quite little at this stage of the game I think. Obviously the ECB can (and should) be taking steps to move into line with the Federal Reserve and the Bank of Japan and start readying up some sort of "European" version of quantitative easing, but as far as the national government goes, then I think we are near to the hang on tight and keep your fingers crossed stage. Chancellor Angela Merkel's governing coalition did agree this week to a further 50 billion euro economic stimulus plan which includes items like investments in infrastructure, and tax relief and payments for families with children. This follows an earlier plan worth 23 billion euro, which was criticized at home and abroad as being too cautious. But what I think most observers don't appreciate sufficiently is that in an export-driven economy, where population ageing means that domestic consumption is simply not going to take up the slack and drive the economy, then there is simply a limit to what any government can do - without spending money which is going to be badly needed to pay future pension and health care costs, that is. German Finance Minister Peer Steinbrueck admitted in a newspaper interview with Financial Times Deutschland that he now expected Germany's fiscal deficit to exceed 4 percent of gross domestic product in 2010 taking into account the latest stimulus plan. The issue here isn't simply that EU rules require member states to rein in deficits to no more than 3 percent of gross domestic product (and cap national debt at not more than 60 percent of GDP), we are in an emergency and emergency measures are needed. But EU member states also agreed in April 2007 to balance budgets by 2010, and Germany had been very critical of France for saying they would not be able to meet this target. 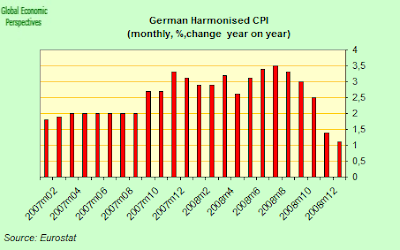 Germany had already violated the deficit rule for four straight years between 2002 and 2005. "Of course I would have liked to present you with proof at the end of the legislative period that we would manage to have a budget without new borrowing in 2011. Under normal circumstances, we would have managed that," Steinbrueck said. "But we are dealing with a sharp recession, an enormous financial crisis and a crisis in the auto sector." The point is that falling back on this target will not come cheaply, in the sense that balancing the books was agreed to for a reason - the need to meet the costs of sustaining a society with a rapidly rising elderly dependency ratio. There is a lot of discussion of widening eurozone bond spreads in the eurozone at this moment, but I find myself asking one simple question: if investors start to get worried about the sustainability of German financing, whose bond will become the benchmark against which the other spreads will rise, France's perhaps? Black Hole In The Banking System? And there aren't only holes in the real economy to try and plug (with cement), the financial sector is also becoming an apparently bottomless pit, with the government being poised on Friday to step in and part-nationalise a second bank. Hypo Real Estate is once more in emergency talks with Germany's bank rescue fund about a deal that looks likely to give the government a stake in the troubled investment bank. These negotiations draw a difficult week for the German banking sector to a close, following the announcement by Deutsche Bank of a 4.8 billion trading loss in the last three months of 2008 (which compares with a profit of about 1 billion euros a year earlier) while landesbank WestLB prepared to warehouse risky investments. WestLB wrote to its owners, local savings banks saying it needed to park troubled assets off its balance sheet in order to stage a recovery - the value of the doubtful assets involved is thought to be about 50 billion euros. Munich-based Hypo Real Estate on 12 January received an extension until April 15 on a 30 billion-euro framework guarantee provided by Soffin, Germany’s bank-rescue fund. The lender said at the time that talks with Soffin regarding more extensive and longer-term liquidity and capital support measures are continuing. Commerzbank AG, Germany’s second-biggest bank, got a second state bailout on 8 January to strengthen its capital following the acquisition of rival Dresdner Bank from insurer Allianz SE. The German government in return agreed to take a stake of 25 percent plus one share in the combined Commerzbank-Dresdner. And there is more to come, much more. Der Spiegel is reporting that the major German banks have so far written off only around a quarter of the nearly 300 billion euros in toxic U.S. assets they have on their books. The finance ministry in Berlin estimates that the entire German banking sector is carrying around 1000 billion euros of risky assets on its books, according to Der Spiegel. The government has aset up a 480 billion euro rescue fund to provide fresh capital or lending guarantees to the financial sector, and has already committed 100 billion of the 400 billion set aside for loan guarantees and 18 billion of the 80 billion earmarked for capital injections. However, some see even this as insufficient and there have been mounting calls for the creation of a "bad bank" that would buy up risky bank assets. Finance Minister Peer Steinbrueck was quoted by the Frankfurt Allgemeine Sonntagszeitung weekly newspaper as saying he could "not imagine (such a step) economically or above all politically". A bad bank would need to be financed with 150 billion to 200 billion euros of taxpayer funds, he said. "How am I supposed to present that to parliament? People would say we are crazy." And to add insult to injury, China this week announced that it had become the world's third-largest economy, surpassing Germany and closing in rapidly on Japan, according to Chinese government and World Bank figures. The Chinese government revised its growth figures for 2007 from 11.9 percent to 13 percent, bringing its estimated gross domestic product to $3.4 trillion, about 3 percent more than Germany's $3.3 trillion, based on World Bank estimates. Even though China's growth is now dropping rapidly - and some estimates suggest it may only be 6% in 2008, Japan's is currently shrinking, and the growth differential is sure to remain, however bad China's performance actually does turn out to be in 2009 and 2010. Hence I don't think it will be that many years before China's GDP manages to overtake Japan's, which is currently estimated to be worth around $4.3 trillion. This post is partly about Russia, partly about how to follow the present economic crisis on a day to day basis and partly methodological. So Which Are The Worst Affected Countries In The Present Crisis? Obviously the simple answer to this question is "all of them", and in particular all those countries who are members of the OECD. Perhaps that is the feature which best defines what is happening this time round (and which separates our present problems from, say, the Asian crisis in 1998) since this is a crisis whose focus has been, and still is, in what are often termed "the advanced industrial" economies, even though some of these are now more services than manufacturing-industry driven. But, come-on, within that ever so long list - which includes each and every member of the OECD (and a goodly number of those who aren't) - who exactly are going to be the worst affected? 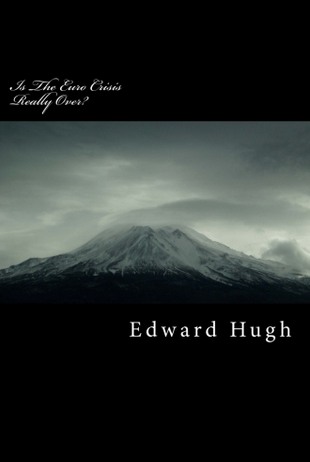 Well I don't think I have made any secret on this blog that I think the principal focus of the present crisis is now situated in what Paul Krugman call's Europe's periphery - by which I would mean Central and Eastern Europe, Southern Europe, Ireland and the UK. To that list I would simply add those economies who are largely export driven, and who thus suffer most directly from the sharp contraction in global trade. In particular here Germany, Japan and China. My principal guess is that China is really going to be one of the worst case scenarious, and that consensus thinking still has some way to go in catching up with events here. Hong Kong based UOBKayHian have a Q4 estimate for year on year Chinese GDP growth of 6.3% for China (see here), and I think few people other than professional macro economists and bank analysts (and far from all of these if the truth be told) really realise what this means - it means the quarter on quarter rate of expansion was very low indeed, possibly verging on the negative. I'm guessing but it must have been somewhere in an annualised 0 to 2% range. This means we may well see quarter on quarter negative growth in 2009 in China, and that the possibility of a technical recession of two consecutive quarters of negative growth must be over 50% at this point. It wasn't so long ago that the consensus was saying that annual GDP growth which was as high as 6% would be tantamount to a recession! Societe Generale economist Albert Edwards is one of those who has been drawing our attention to the rapid decline in China's GDP (although I myself had a go here) and he uses one very interesting "proxy" (an indicator which can serve as a rough and ready substitute for something else, in this case movement in GDP) - electricity output. 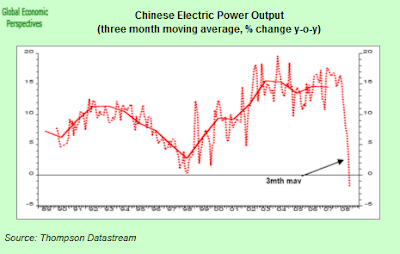 If you look at the 3 month year-on-year moving average for electricity output in China (see chart below) you will see it is already falling, which means that (in all probability) China's GDP is falling, which is just wow! The history of using electrical output as a convenient proxy where we simply don't have very adequate data has a long and reputable history - going back to the pioneering work of US growth theorist Edward Dennison in the 1960s - but in case you feel that the correlation may not be a good one, here (see below) is a chart from Edwards which shows China GDP and electricity output compared. 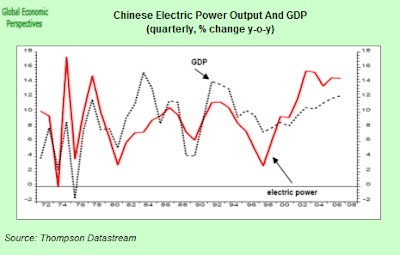 The fit is obviously not a perfect one, but that isn't the name of the game here, what should be evident is that a drop in electrical output as large as the one we are seeing in China at this point will be reflected in a very sharp reduction in GDP output. 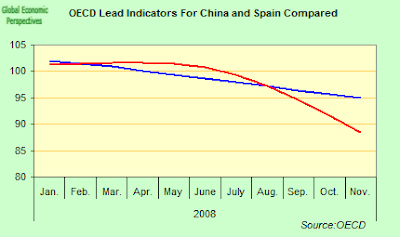 A very similar situation can be seen in the OECD lead indicator for China, and below I produce a chart which compares this indicator for both Spain and China, and Spain we know is having a very strong contraction at this moment in time, but what we can see is that China post August is slowing much more rapidly, and even, looking at the steepness of the month on month drops, may well have started contracting in November. This is obviously all shell shock stuff. Which takes me on to my next point, how reliable is Chinese data? Well, perhaps I am going to surprise some of you here, but I would day that for my purposes it doesn't really matter, since what interests me is the rate of contraction (or expansion) in Chinese GDP, and not its absolute level. What matters to the rest of the world is not expecially how rich -or poor - China actually is (from a macro economic analysis point of view that is), but how rapidly it is expanding - or contracting - and what the rate of export and reserves growth is. The rest is interesting, but from a nuts and bolts point of view, it constitutes what Boris Vian used to call froth on the daydream. If the official data is rather inaccurate, then it is not unreasonable to assume that the inbuilt biases are the same from one time period to the next (the same point applies to the existence of the so called "informal economy"), and so my message here is - arrived at on the basis of looking at one economy after another in rapid succession - how much we can learn from how little, if only we know what we are looking for that is (I will come back to this point below). Is Manufacturing Output A Good Proxy For GDP? Basically, the economies I am arguing are likely to be the worst affected in what we can at least now call “the long recession” - Japan, China, Russia, Germany, East Europe and Spain - all have quite a significant level of dependence on their manufacturing industry (except Spain, but then Spanish services are now neck and necking it with Spanish manuafcturing industry), and it is manufacturing - and especially consumer durable and machinery and equipment manufacturing - which is worst affected by this stage of the credit crunch. In addition all these economies are now about to see "second round effects" across their manufacturing sectors, and this will then feed back into even stronger contractions as domestic purchasing power weakens even further. So I don’t think that in these cases manufacturing is such a bad proxy for what I want to look at, which really is the size of the hole that has just been blown in the side of the collective ship. Basically, I am also relying on an old macro economists prejudice about the structural importance of industrial activity when all the froth is stripped away. It’s a hunch. I’m playing it, and the proof of the pudding will be in the eating, although up to now I think I ain’t doing too bad, if I may say so, since the German and Japanese economies did actually fold right on cue as far as my forecasts went, Spain has turned out to be a nightmare, and the focus of the current global financial crisis has moved to the East of Europe, just as I was anticipating in my posts here and on all those Eastern Europe blogs I maintain. 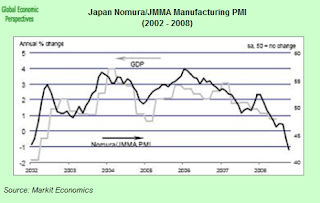 And for those of you who still remain sceptical that this argument has any validity, even for economies with a heavy industrial dependence, here (one more time) is the Manufacturing PMI/GDP comparison chart for Japan - GDP rates to the left, diffusion index PMI readings to the right (click over image if you can't view too well). Not perfect, but not a bad guide I would say, if you like your football live, and want to see what is going on as it happens and not three to six months later. 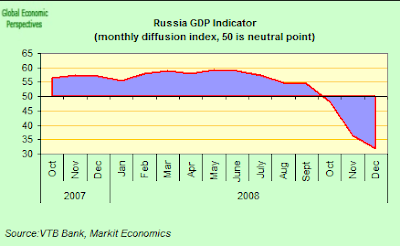 In December, the Russian GDP Indicator fell below zero for the first time since March 1999, to -1.1%, from 2.1% in November. Over Q4 as a whole, the GDP Indicator has signalled a year on year expansion of 2.0%. But this is perfectly consistent with a quarter on quarter contraction, as we can see in the monthly diffusion index GDP chart. 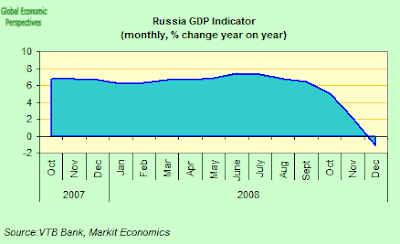 So there is no doubt about it as far as I am concerned, the Russia economy contracted in Q4 2008, and really, effectively, the Russian recession has now started. Further evidence for the slowdown can be found in the fact that unemployment rose 400,000 in November and while retail sales grew at the slowest annual rate in five years. Also in November, real disposable income fell on an annual basis while capital investment growth continued to drop back. The rouble ended 2008 20% lower versus the US dollar and 15% weaker against the euro, while the budget for 2009 remains under threat from falling oil prices. The most recent official GDP figures from the Federal Statistics Service indicated year on year GDP growth of 6.2% in the third quarter of 6.2%, a figure which was itself a three-year low. This result was rather weaker than the advance trend registered by the GDP Indicator, which averaged 6.8% over the same period. The stronger VTB GDP Indicator may well reflect the absence of construction coverage in the PMI surveys – annual growth of construction value added in Q3 almost halved compared to the previous quarter – and probably also did not fully capture the effect of plummeting oil prices and weakening investment growth, on the other hand it the number is not a bad first estimate at all, and I emphasise, we get it at the end of the month in question. 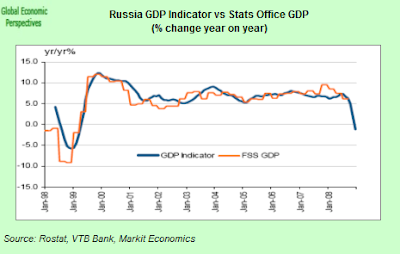 In fact over the past nine years the official statistics office series and the VTB GDP Indicator have had a pretty close relationship, and the correlation is currently 0.88 (see chart below). Moreover, the Indicator has successfully captured the major peaks and troughs in growth throughout the period, thus I think we need to take the latest PMI based data very seriously indeed. So How Can You Do So Much With So Little? Now for the methodological part. Basically I am arguing that really it is possible to make reasonably accurate short term forecasts (longer term ones are always - like the weather - much more problematic) on the basis of very little information, the composite PMI is one key reference point here, followed by consumer and business confidence data to give some idea of the immediate outlook, and then employment data to let you know what may happen six months or so down the line. This, and the inflation data (both producer and consumer prices) are all you really need in your home "Chief Economist" amateur toolbox really in order for you to have as good a chance of getting it right as any very highly paid professional. But there is something else you also need: a framework in which to organise the information you gather. This is the tricky bit really. The good economist should always be testing, or pressing him- or herself in some way or another. Basically a forecast is based on conformity with empirical fact and with a theoretical framework. The late Sir Karl Popper had something to teach us here. Famously, Popper used to enter the first class of any course and give his students one of those thrilling little "ice-breaker" exercises. "Observe", he would tell them, and then sit down and start to read his newspaper (I doubt it was L'Equipe, or El Mundo Deportivo, but I'm sure you can more or less imagine the picture). Of course, normally not a lot of time would elapse before one of the bemused students would put their hand up and say, "but please, sir, what do we observe?". "Exactly", would be Popper's response, and so the course would formally begin, since the simple point he wanted to get across was that simple inductive empiricism doesn't work, you always need a theory, or at least a hypothesis, to get the game started. Which is why some people could probably stare at the charts I have presented here today, and still not notice anything special. And the other point Popper would draw to the attention of any good practicing economist is that you always need to be trying to prove yourself wrong. It turns out we are not, as Bacon thought, playing a game with nature, we are playing it with ourselves. What exactly am I getting at here? Well, Popper wasn't the first to do this, but he did notice that there was a simple problem with inductive empiricism, in that, no matter how many observations you make you can never actually "prove" a theory, since the next observation may well come along (you know, that black swan in Australia) and knock your whole edifice over. Popper was possibly the first, however, to notice that there is a logical asymmetry lying around in all this, since you can faslify a proposition (or hypothesis, or theory, or law), since the first bit of counter evidence you get should at least start you thinking that something may not be completely aright - although, of course, the first piece of counter evidence should never lead anyone to abandon their theory or hypothesis. But it should set you thinking. The knack then is, and this is what every worthwhile and halfway serious economist should be trying to do, to try and decide what sort of evidence would make you change your mind, and would lead you to first modify, and then abandon, your theory. And I think if you can't spell out what it is that would lead you to modify and change your framework, that is if you can't spell out a body of facts and events which would lead you to seriously change your mind, then you are probably not doing serious economics at all, but playing round with some variant or other of what Popper would have called ideology. If China doesn't get a level of GDP output well below the consensus in 2009, then I've got something pretty wrong somewhere. 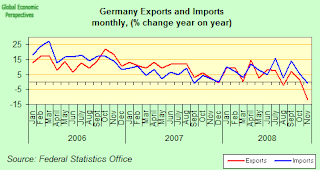 If Germany's stimulus programme works by bringing domestic demand back to life before external events enable exports to expand again ditto. If Japan doesn't go shooting straight off back into a serious bout of deflation the same (and if Germany and Spain don't follow suit at least in the short term then there is something here I am not getting right). And of course, if Russia doesn't have a very nasty bout of depression economics in 2009, and if Eastern Europe generally is not the most seriously affected region then I think I really do have something, somewhere upside down (due to the very unusual demographics). Oh, and yes, if Turkey ends up as badly off as the rest of the CEE economies I would not be methodologically happy at all, not at all. 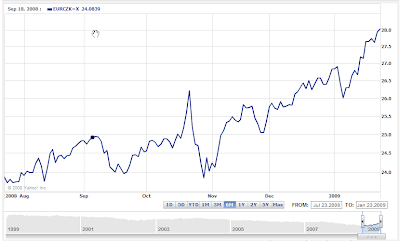 And why do I say this, well here is what I said in a post entitled Turkey, Emerging Markets and the Coming Global Credit Crunch - published on Global Economy Matters on 5 September 2007, that is about three weeks after all that sub-prime "turmoil" broke out. In the last two decades, many middle-income countries have experienced boom-bust episodes centered around balance-of-payments crises. There is now a well-known set of stylized facts. The typical episode began with a lending boom and an appreciation of the real exchange rate. In the crisis that eventually ended the boom, a real depreciation coincided with widespread defaults by the domestic private sector on unhedged foreign-currency-denominated debt. The typical crisis came as a surprise to financial markets, and with hindsight it is not possible to pinpoint a large “fundamental” shock as an obvious trigger. After the crisis, foreign lenders were often bailed out. However, domestic credit fell dramatically and recovered much more slowly than output. In starting off with this quote I really want to draw attention to two things. First off, the way in which the current sub-prime liquidity problem in the banking sector of many developed economies is now steadily extending itself into a credit crunch in several emerging market economies. We are now beginning to see a clear and all too familiar pattern. There has been a lot of talk about the Asian crisis, and evidently there are some similarities with the pre 1998 situation, especially, as I shall be arguing over the coming days, in the emerging economies of Eastern Europe. Secondly there is the "typical crisis came as a surprise to financial markets" argument, since it puzzles me why exactly this should be, or better put, why it should be assumed as a "stylised fact" about currency crises that such major events are in principle not forseeable. I find this very hard to accept. 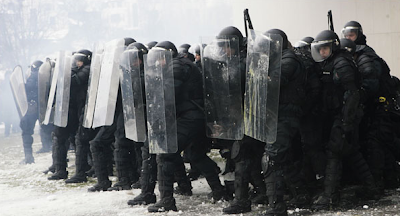 Are we really so inept we are not able to see trouble coming when it finally does come? Is economic theory really so useless in the face of complex "on the ground" facts. Something inside me resists this view. We ought to be able to see things coming, even if we need to distinguish between the where and the when. What I mean is that it should be possible, if the theories you are working with are worth any sort of candle, to pinpoint the areas of likely vulnerability. On the other hand, given that often seemingly random events precipitate the ultimate unwind, it is pretty well impossible to say in advance which random event will turn out to be the detonator on any given occassion. The sub prime debt issue in the US is a good case in point here, since only at the start of August the Federal Reserve were assuring everyone that problems associated with the US housing market were well under control, while obviously they weren't and aren't, and equally obviously, now, such problems will be seen from the vantage point of hindsight to have played a key role in the events which are now unfolding before our eyes. So even with this caveat, and with due regard for the well known problem of human fallibility, lets see if this time any of us are able to do just that bit better than normal, and in attempting to see things coming lets see if we can learn something which may make us better able to handle and foresee macro economic problems in the future. 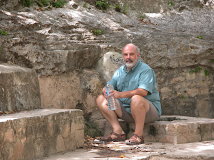 This post is about Turkey, and it may be surprising in the light of what I have just said if I now go on to suggest that it is precisely the fact that Turkey may not be so badly ensnared in the trouble which is brewing (I mean no one, but no one, will escape completely scott free) as some other emerging economies (and I am talking here about some key members of the EU10 accession countries, and for reasons explained in this post)which may well be of interest. So summing up, I don't accept that economics is not an empirically grounded science that is incapable of making testable forecasts, not for a moment I don't. And if you do the sort of economics that turns out to be absolutely useless when it comes to making forecasts, then you should be asking yourself what it is about the theoretical framework you are using that leads to this situation, asking yourself what would need to be the case for a part of what you hold dear to be falsified, and get out there having a go at falsifying it. 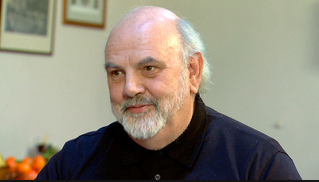 Manoel de Oliveira (photo and quote above) is a living example for the Potuguese people of how to force their way out of the low growth/low per capita income trap into which they have steadily stuck their neck. Oliveira celebrated his 100th birthday last December - and how did he celebrate it: by starting work on a new film. Traditional productivity theory suggests most people slow down with age, but Oliveira seems to have done just the opposite - and since 1990, he has made at least one film a year. His secret for longevity, work much and rest little (oh yes, and also remember that living in hope is fundamental, it's funny, but my father who lived to be 84 and worked to 80 gave me the same sort of message). Indeed far from implementing a 35 hour week he seems to only stop on Saturdays - "This is the only day of the week that I rest," he told journalists back in December when he interrupted shooting on his latest film to give them a rare press conference. So in a country where the average age of leaving the labour force is currently 63, and where raising employment participation rates is a national priority, what better example of a "local hero" than Manoel. What follows will be an attempt to reveal just what it was he was so meticulously trying to capture with his camera in the photo above. Just call me an inveterate "peeping tom", lookout Portugal all is now going to be revealed! Portugal, it seems lives in perpetual hope, hope for that sustained and substantial recovery which always, somehow and disappointingly, lies waiting for it just around that next corner but never actually appears. 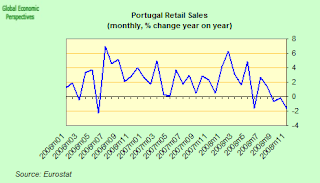 Equally Portugal is not in recession, at least not yet it isn't, although if we look at the most recent movements in the EU economic sentiment indicator, the Portuguese economy could hardly be said to be passing through one of its best moments. The thing is, since the turn of the century it has been hard for anyone to identify one of those "better moments" in the Portuguese case, or to offer some empirical justification for that evident existential need we all have to eternally live in hope. 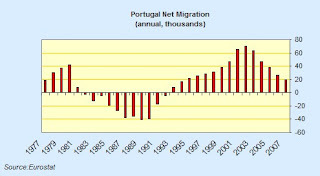 Having said this, Portugal could also hardly be said to be riding the wave of a boom-bust trajectory (like its Iberian counterpart and neighbour), since if you never got the boom in the first place, well you obviously aren't going to get the bust part either. 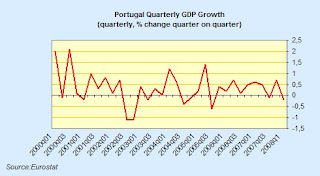 So it should not surprise us to find that after contracting slightly during the first quarter of 2008, the Portuguese economy has continued to move forward, and was even continuing to "sustain" a 0.7% year on year growth in Q3 2008. Hardly spectacular, but then (as we shall see) Portuguese growth has hardly been spectacular in recent years, but equally far from being a "worst case scenario". But then, as we know, everything that lives was born to die, and so it will be even with Portugal's current (lacklustre) expansion, with the Portuguese economy seemingly set to contract this year for the first time since 2003 as its main export markets weaken and Portuguese consumers rein in their spending. Portugal's central bank now expect the economy to shrink by 0.8 percent in 2009 - a downward revision from its July forecast for a 1.3 percent expansion. Also according to the bank, the country’s economy probably grew 0.3 percent last year, a prognosis which seems reasonably realistic following Prime Minister Jose Socrates recent admission that the economy shrank 0.1 percent in the third quarter. 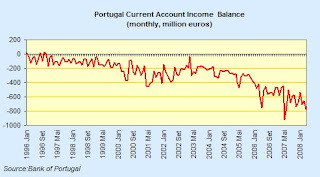 So even while Portugal sustains, resistance, this year at least, would seem to be futile. 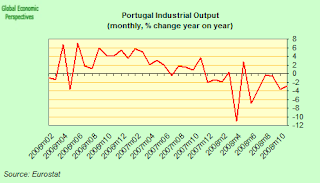 All the main short term indicators (industrial output, retail sales, employment etc) showed significant weakening in the second half of 2008 (industrial output, in particular, really went west in the second half - and together with manufacturing industry, construction activity was down, although it is important to note that in Portugal's case construction was never really "up" - or at least in recent years it wasn't as we will see below). Industrial output was down 2.9% in October over October 2007, and contracted on a year on year basis in each of the five previous months (see chart below). Retail sales were down 1.6 % year on year in November and by 1.4% from October (seasonally adjusted). As just one indicator of the way demand for some Portuguese products is waning at this point, the three European countries most affected by the heavy-truck sales plunge are Spain, Portugal and Germany, with respective declines of 58 percent, 40 percent and 34 percent registered in November. As in other countries the automotive sector is being particularly hard hit, and the government announced a 200 million euro credit line for auto and car parts exporters back in December. The package, agreed between the government and companies including Volkswagen and Peugeot Citroen includes 70 million euros for training courses for some 10,000 employees - the Portuguese association of auto industry producers has estimated that the downturn in car sales will lead to 12,000 job losses during the first half of 2009. Economy Minister Manuel Pinho has stated that, including trade credit insurance of 300 million euros and the potential investments that the incentives should generate, the total value of the government plan is likely to be in the region of 900 million euros - not a lot of money in terms of the sort of programmes being seen in countries like the United States, but for a small, comparatively poor country like Portugal, with a government debt problem to think about, hardly insignificant. As the big wheel of global events follows its charted course, Portugal can at least be thankful for small mercies, since the country is not suffering under the added burden of a housing crash (it is not an Ireland, or a Spain, or the UK, or even, dare I say it, Denmark), for the very simple and straightforward reason that it never had a housing boom in the first place (or better but, since the late 1990s it hasn't had one, and one of the purposes of this article will be to examine just why that is). Portugal's problems are, unfortunately, more long term and more endemic, strikingly similar in many ways to those of Italy. So we should beware of making a simplistic generalisation and talking about a North-South divide in the eurozone. The economic profile of Portugal (or Italy) is really rather different from that of Spain (or Greece), in much the same way that France's economy is essentially very different from Germany's (of course, Sir Roy Harrod will probably be turning over in his grave at this point, with the thought of what this might imply for the theory of "convergence", but for now we might perhaps leave him in his tomb to timelessly struggle with this rather thankless labour and move on, since before jumping to too many overhasty generalisations it may be worth first examining in detail the actual dynamics of a number of the individual eurozone economies). The nice thing about empirically grounded sciences is the freedom they give their practitions to follow (or chase after) the "facts", without the pressure of being compelled a-priori to reach premature conclusions, regardless of whether or not it is considered to be politically - or incorrect - so to do (hence Ben Bernanke's multiple references in "The Euro At Five" to the eurozone as a great experiment, a "natural experiment in monetary economics"). We economists have to learn to live with the experimental nature of our science, even if the "rats in the maze" may get somewhat frustrated with our efforts at times. 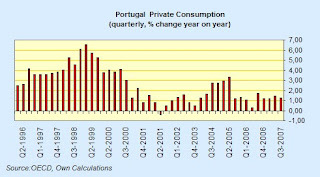 Now if we look at the chart below we can see that if quarterly growth in Portugal is sluggish, this sluggishness has in fact been operative over quite a long period of time. 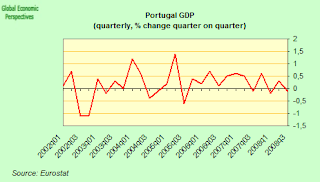 In fact since Q1 2000 Portugal has had 2 recessions (when defined as two successive quarters of negative growth): in Q3/Q4 2002, and Q3/Q4 2004. There have also been 7 more quarters where growth has been negative: Q2 2000, Q1 2001, Q2 2003, Q3 2005, Q3 2007, Q1 and Q3 2008. That is out of a total of 30 quarters, the Portuguese economy has contracted in 11, or around 30% and the average GDP growth rate has been 0.37% per quarter or 1.48% per annum. For a country whose per capita income is the lowest in the EU15, and which is badly in need of "catch up" growth this is hardly a happy situation, and beyond the national administration should be giving food for thought for those resposible for economic policy across the Eurozone, and also among those among the EU10 who have recently joined, or are set to join, the common currency area. Even more worryingly, Portuguese growth seems to have gone through three phases since the early 1980s, with each "wave" being weaker, and indeed during the years since entering the eurozone Portugal seems to have gotten absolutely no "boost" whatsoever. So what could explain this evidently "sub-par" performance? Well, during the years of ERM participation (the precursor of the euro) Portugal's nominal interest rates dropped from 16% in 1992 to the 4% eurozone entry rate at the start of 2001 - while real interest rates dropped from 6% to zero - so the problem doesn't appear to be - prima facie - what you could call an overly tight monetary regime: post euro-creation ECB interest rate policy has been largely accommodative to Portugal, and in particular interest rates were, by and large, negative during the entire period between the end of 2001 and the end of 2006. Yet, economic activity remained sluggish throughout this period, and even the construction sector showed little sign of life. 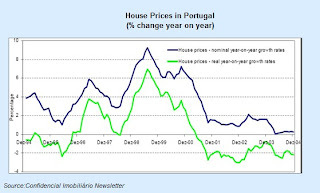 In fact the last house price spike Portugal had was in the years 1998/99, and during most of the years since Portugal joined the euro (as can be seen in the chart below) house prices have in fact been falling. 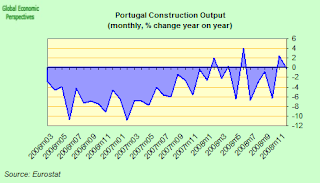 And if we look at the construction output charts, during all of 2006 and throughout the first half of 2007 the Portuguese construction industry seems to have been in something of a deep slump. 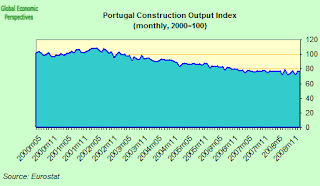 Even more preoccupyingly, Portugal's construction industry seems to have past its historic peak in 2000, with the output index declining steadily ever since. While the banking system may not be the most splendid of health (remember there is that little issue of the current account deficit to finance), it has not taken any kind of "full frontal" hit from the global financial turmoil - having little exposure to US sub-prime type debt, and no large pile of housing loan defaults set - Spansih style - to arrive and spoil the party. So Portuguese Prime Minister Jose Socrates may well have been right when he reiterated recently his government's view that no major Portuguese banks are likely to fail. However, since the global financial crisis hit major U.S. and European banks last October, the Portuguese government has reacted by offering state guarantees of up to 20 billion euros on bank loans and 4 billion euros in capital for local banks. Portugal's top banks - Millennium BCP, Banco Espirito Santo and Banco BPI - all seem to weathered the crisis relatively well so far. The government has had to nationalize the small private bank Banco Portugues de Negocios (BCN) while a consortium of larger banks have been invovled in rescuing Banco Privado Portugues (BPP), but the financial problems here preceded the current global financial crisis and seem to have been merely exacerbated by the credit crunch. The 2009 prospects for Portugal's construction sector seem pretty bleak for 2009 - after the sector probably failed to expand in 2008, following six previous years of decline. Manuel Reis Campos, president of the Portuguese Federation of Construction Industry and Public Works (FEPICOP), expects turnover to be around 20 billion euros in 2008, a similar number to 2007. Reuters. "The overall sector progress is going to stagnate in 2008," he said. forecasts have to be very cautious." Campos said the industry has been in decline since 2002 "and it's not a result of the current international situation". He expects the situation to improve in 2009 on the back of government infrastructural project (see below) but his outlook for residential construction is for yet another decline - possibly by between 3 percent and 5 percent. Residential construction has the heaviest weighting in the construction sector (38 percent) and the industry accounts for 5.6 percent of gross domestic product employing 11 percent of the workforce (560,000 jobs). 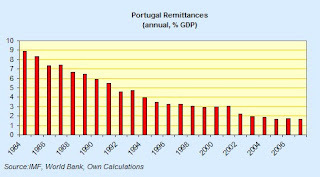 One explanation which is often offered when people come to look at Portugal concerns what has been happening to what is called the Real Effective Exchange Rate. Now the Real Effective Exchange Rate (or REER) of a country is an instrument which can be used to assess price or cost competitiveness relative to the position of the country's principal competitors. The REER is an instrument which is widely favoured by economists since competitiveness depend not only on exchange rate movements but also on cost and price trends. Eurostat offers us one such measure of REER, and the REER used in the construction of the Eurostat Indicator has been deflated by nominal unit labour costs (for each economy as a whole) against a panel of 36 countries (EU27 + Australia, Canada, United States, Japan, Norway, New Zealand, Mexico, Switzerland, and Turkey). A rise in the index means a loss of competitiveness (taking into account productivity changes via the movement in comparative unit costs), and as we can see in the chart below, Portugal has substantially lost competitiveness against Germany since 1995. Were a convergence in living standards taking place between Portugal and Germany via a more effective use of a pre-existing labour force, or a boost in productivity achieved through a shift across productive sectors (eg away from agriculture and into knowledge economy products) the we would not expect to see this pattern, since any increase in living standards would be accompanied by a maintenance in the competitive position. (This point, in Portugal's case, is unfortunately highly theoretical, since as we will see below, convergence in living standards is not in fact taking place. That is, Portugal really is stuck). In fact I have been a little naughty here, since I have also included Spain in the comparison. 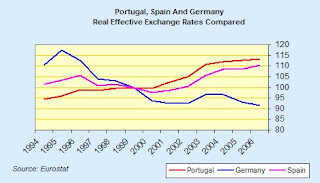 I have done this since the argument that Portugal has lost competitiveness against Germany is fine as far as it goes, but as an explanation for why Portugal's growth has stagnated post 2000 it is clearly insufficient, since growth in Spain - at least up to 2007 - has been rather stellar, so the question should really not be why is Portugal so different from Germany, but why is Portugal so different from Spain (as I said above, we shouldn't be dividing Europe simply along a north south axis, and that the differences within regions (like also the Germany-Spain one) are also interesting and very, very revealing. Now basically it seems to me that you can say either one of two things, but not both of them at the same time. Either Portugal should have had the same growth as Spain (all other things being equal), or Spain should have had as little growth as Portugal did. In reality the likelihood is that both countries have had their growth paths rather skewed (in opposite directions) by participation in monetary union, but going further along this path at this point would take us well beyond the matter in hand. So what we have here is a very strange state of affairs indeed, and it should lead us to ask ourselves just what it is than has been going on in Portugal over all this time? 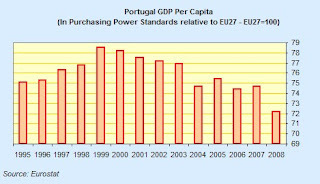 In addition, and as can be seen below, Portugal's relative GDP per capita (vis a vis the EU27) has declined steadily since euro membership, after reaching a high point in 1999. So What Is The Root Of The Problem? 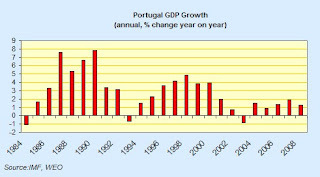 In the first place Blanchard divides Portuguese growth into two periods. 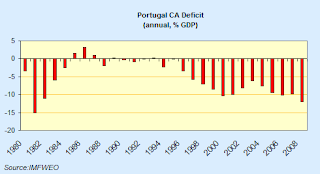 During the first of these - running roughly from 1995 to 2001 - Portugal experienced reasonably healthy GDP growth, a steady decrease in unemployment, all acompanied by a rapidly growing current account deficit. During the second period, roughly since 2001, there has been continuously weak economic growth, a steady increase in unemployment, while the current account deficit has remained stubbornly high, and even (since his paper was written) increased. 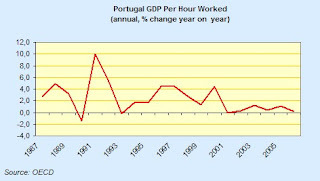 Blanchard argues that the proximate cause of Portugal's mid 1990s boom was participation in the ERM and in the build up to the euro (the longer term cause would, I feel, be some yet to be identified underlying structural transformation that was going on, trying to get to grips with this is the point of this article). This participation combined with expectations that participation in the euro would lead to faster convergence and thus faster growth for Portugal, lead to an increase in both consumption and investment. But, of course, as we have seen, this convergence did not take place, nor does it appear likely to do so. 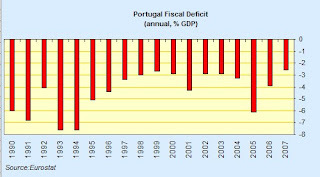 During this phase Portugal's budget deficit decreased slightly, although discretionary fiscal policy was generally expansionary. Blanchard makes the point that between 1995 and 2001 the cyclically adjusted primary deficit (adjusted for the effects of lower interest rates and output growth) increased by roughly 4%. This choice of dates does seem to me however to be rather tendentious, since - as we can see from the chart below - the main increases in the deficit came after 1999, and in that sense are not really part of the period that should most concern us, which is the one immediately prior to the domestic consumption and construction fixed investment blow out. One possibility here would have be that the budget deficit simply "crowded out" private activity, and placed an excessive burden on an already overstrained capacity. But if we come to look closely at the timing of things, this argument may be harder to sustain than seems at first sight (and indeed government spending as a percentage of GDP only really started to rise sharply after 1999 - see chart further down the post - and thus post dates the contraction in private consumption). 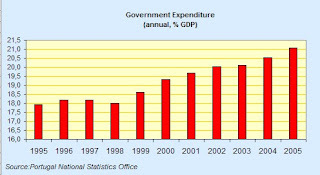 The fiscal deficit was in fact reducing from 1994 to 1999, and only started to rise again after 1999. On the other hand, if we look at private consumption growth, we find a rather different pattern, since private consumption growth peaked in Q1 1999, and then dropped back steadily all the way through to Q2 2001, at just the time the fiscal deficit was increasing. So the increase in government spending can be thought of as a knock-on consequence of the decline in private consumption growth and not the other way round. It was simply due to the automatic stabilisers coming into action. So the big question is why, in the Portuguese case, the construction and consumption boom came to an end when it did, while it continued and even accelerated in Spain and Greece, rather than why the fiscal deficit started to increase. The drop in unemployment which accompanied the initial boom lead to significant labour market tightening, and this tightening - coupled with rising EU convergence expectations and talk of Harrod-Balassa effects and suchlike - produced a situation where wages increased rapidly in comparison with other EU countries. Again we should note the similarity between what happened in Portugal and what has been happening over the last two or three years in Eastern Europe, where certainly the comination of sharp decreases in unemployment and strong euro area membership expectations has acted like putting a lighted match to a tinderbox. To take just one example, when Portugal joined the EU in 1986 workers without college education earned only 50% of corresponding French wages in PPP terms, while college graduates earned 72%. By 1994 unskilled and skilled wages had risen to 67% and 93% of French wages respectively. In addition, nominal wage growth was significantly higher than labour productivity growth, leading unit labor costs to rise at a substantially faster rate than the euro area average. 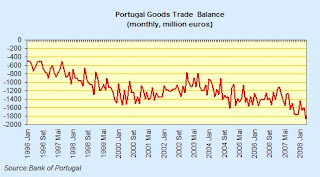 Hence Portugal's competitiveness deteriorated, as did its goods trade deficit. 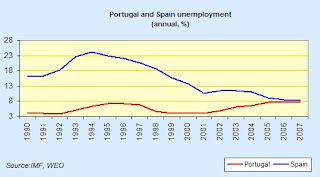 Blanchard takes the view that unemployment at the start of the first period was above what he terms "the natural rate" - since, he argues, while an unemployment rate of 7.3% (1996) is not especially high by EU standards, it was high in terms of what Portugal had become accustomed to by the early 1990s. Thus he considers that capacity existed for some growth in excess of "normal" was not problematic. By the end of the 1990s - so the argument goes - unemployment had become lower than the "natural rate" and non-inflationary "catch-up" growth started to become problematic - again it would be interesting to make a comparison with what just happened in Eastern Europe in this context. Blanchard also takes the view (and I thoroughly concur) that some degree of current account deficit was clearly justifed in Portugal in the mid 1990s (since if everyone runs a suplus the whole global system cannot work), given that the arrival of both a lower real interest rate together and expectations for faster "catch-up" growth is likely to stimulate higher private spending, be this from private consumption or be it from investment. The real real issue is that this boom, in theory at least, should lead to a structural transition to higher productivity and higher value added activities, and the issue in Portugal's case is that the needed and anticipated higher labor productivity growth simply did not materialize. Instead, productivity growth nearly vanished, averaging 0.2% per year from 2001 to 2005. The end result was that the investment boom came to an end as household spending effectively stalled due to the high levels of household debt which were accumulating and the deterioration in future prospects which was taking place (can anyone else smell the Baltics here??). So private consumtion growth stalled and household saving increased. 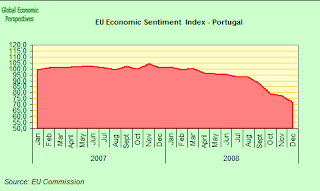 The end consequence has been that, in an environment where increasing exports to drive GDP growth became very difficult due to the absence of an independent currency and monetary policy and a lack of price competitiveness, the slower rate of consumption growth and the consequent weak investment demand have led to an enduring output slump, while Portugal's unemployment rate has now returned to its former higher level (7.9%) and the current account deficit has steadily increased, reaching 9.4% of GDP in 2007. 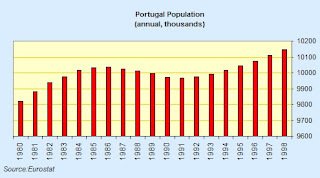 Several commentators have drawn attention to the similarities which may be discovered by scrutinising Portugal in the context of recent events in the East of Europe (see this example from Christoph Rosenberg), and I would like to take this opportunity to draw attention to the remarkable common points I have been finding between what happened in Portugal in the 1990s and what has been happening in Hungary since 2005 (or see this earlier post). In the first place because both countries found themselves faced with a twin deficits crisis, both saw fiscal spending surge sharply upwards as a response to a sudden drop in domestic consumption, both have been unable to sufficiently ramp up exports as a result of excessive downward rigidity is the wage setting process, both have had absolutely stagnant employment growth, and both, and here is the really unusual detail, were experiencing downward movements in their population at the time their problem really got going. Quite what connection one thing has with the other reamins to be established, but I beg to suggest that this correlation is far from incidental. 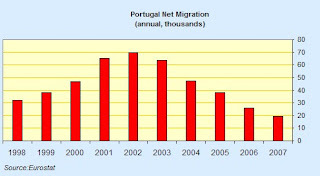 If we look at the Portuguese case we can see the downtick in overall population numbers quite clearly when we look at the relevant chart (see below), the unusual thing about the Portuguese case this is more the by product of "freedom of EU movement" outmigration (more appropriate to the Baltic and South East Europe connection than the Hungary one) than it was to the impact of lowest-low fertility, since while Portugal's fertility has been below replacement level since 1982, it only really fell below the critical 1.5Tfr rate in 1994. If we look at the long term migration chart, we can see where the root of the problem was. And if we also look at the chart below and see how the supply of remittances has dried up (ie all these potential young consumers have now become a net loss to the economy) we can perhaps begin to understand how it was that domestic consumption started to stagnate. In theoretical terms economists have long spoken about the possibility of having multiple "equilibria", and how economic processes are to a certain degree "path dependent", well in the cases of Spain and Portugal we couldn't have a clearer example I think. If we look at net migration between 2000 and 2008, the difference between the two countries is plain to see. Spain went up and up. While Portugal went down and down (see below). We couldn't have a clearer example of the contrast between positive and negative feedback processes, illustration of how most contemporary migrant flows are "labour market driven". 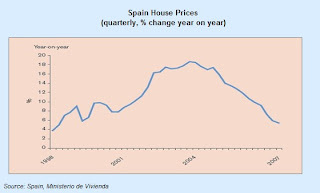 And again, if we think about house prices (see earlier Portugal chart) Spain was going through an enormous asset price inflation boom during these very same years. 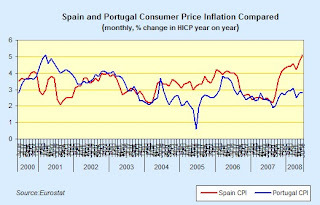 So Spain and Portugal were receiving one and the same monetary policy, with very different results in each case, since while Spain's inflation accelerated during the highpoint of monetary easing, Portugal's rate even dropped. This should give some food for thought to all those who simplistically talk about the "pernicious" effects of low interest rates. And again, as can be seen in the next chart, one and the same monetary stimulus lead to very different domestic consumption paths. 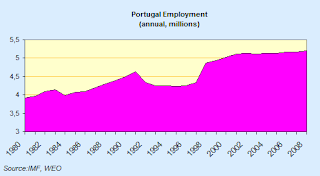 Indeed while Spain's unemployment fell during the first years of euro membership, Portugal's unemployment actually went up. 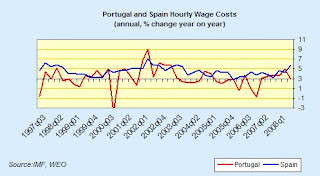 And yet if anything average annual wage cost growth in Portugal has been lower. In Conclusion - Going Off The Rails In Portugal? This is where Portugal is today. In the absence of policy changes, the most likely scenario is one of competitive disinflation, a period of sustained high unemployment until competitiveness has been reestablished, the current account deficit and unemployment are reduced............ It is a process fraught with dangers, both economic and political, and one which can easily derail. Olivier Blanchard - Adjustment within the euro. 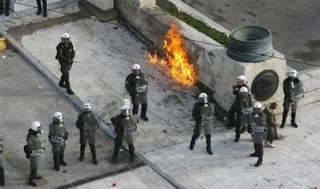 The di±cult case of Portugal, November 2006. Well what we most certainly have not seen in the Portuguese case in any sort of credible process of competitive disinflation (which makes me wonder about the extent to which any such process could work in an East European context like Latvia or Hungary, if the prospect of Eurozone membership is dangled out just before them - falling wages never prove popular anywhere, and politicians have a strange habit of not carrying through things which turn out to be unpopular). 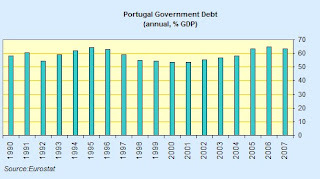 So has Portugals economic and political development process been thrown off the rails. I fear it has. Possibly the clearest example of the extent to which Portugal's economy has been "derailed" is to be found in the stagnation of the labour market. 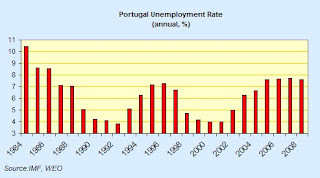 After shooting up as the turn of the century (possibly in a process which involved deep "whitening" of the submerged economy, see chart) the number of people employed in Portugal has actually marked time, and now during the present global recession it may even drop back again, to what would effectively be pre 2000 levels. And now with a global economic crisis breathing down our necks the situation is likely to get worse not better. Indeed Portugal has just announced a 2.2 billion euro package to boost its flagging economy. No harm in that, but when will we really bring the fiscal deficit adjustment to a satisfactory conclusion? The package will focus on investment in schools, boosting technology and alternative energy. The finance minister has said the package is expected to give a 0.7 percentage point boost to GDP in 2009. In 2008, the general government deficit was forecast at 2.25% of GDP, down from 2.6% of GDP in 2007, but this number now seems to be out of date hardly before the ink was dry. In fact the government deficit is now projected to rebound to over 3% of GDP in 2009, this is hardly alarming given the global backdrop, but it is also far from being a positive development. On the revenue front, the economic downturn is expected to take a significant toll on tax proceeds, while on the spending side, some acceleration is expected on the back of higher social transfers, which reflect, first, the (partial) indexation of cash transfers to the previous year's inflation rate; second, recent policy measures, and, third, no further decline in unemployment benefits. Among new spending plans there is a 43 billion euro public-private infrastructure development plan (which is set to run through to 2017), and which includes projects to build a new international airport near Lisbon and a bridge over the Tagus river. The government has also approved an economic stimulus package worth nearly 2.2 billion euros. For 2010, applying a simple no-policy change assumption, the EU commission currently forecast the government deficit to be around 3.25% of GDP, thus after falling in 2007, the government debt to GDP ratio is projected to resume its upward trend and reach 66.5% of GDP by 2010. And this on a "best case" (no policy change assumption) scenario, when clearly there is abundant downside risk to any present forecast. Of course another of the problems Portugal will have in 2009 is that of financing and reducing its current account deficit, which is estimated by the IMF to have hit 12% of GDP in 2008. In particualr I would draw attention to the structural damage to the income account (see chart below) which has been caused by the external financing required by so many years of running such large deficits. Thus as we get into 2010/11 the risk of a serious financing problem on the back of a pair of "twin deficits" which simply get worse and worse is hardly to be taken lightly. Is There A Deflation Risk? Portugal is currently undergoing something of a strong disinflation process, with the annual CPI falling from a high of 3.4% in June to 1.4% in November. Not only that, the general HICP index has actually declined on a month on month basis for four of the last five months. 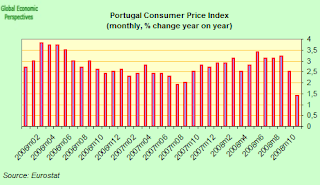 And the danger is that demand falls Portugal could be dragged off behind it into deflation territory. And the coming contraction could be a sharp one with both Bank of America and Deutsche Bank predicting that the economy of the 16 nations that share the euro will shrink by 2.5 percent this year. 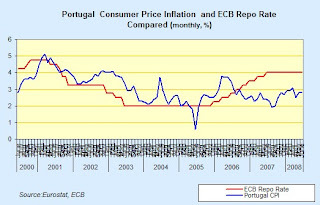 European Central Bank council member and Bank of Portugal Governor Vitor Constancio is aware of the danger and has indicated that the ECB is prepared to reduce borrowing costs further to prevent inflation slowing “significantly” below its 2 percent ceiling, even going so far, if necessary, as to introduce some variant of quantitative easing. He still thinks it won't happen, but he is well aware of the possibility, as indeed we all should be.